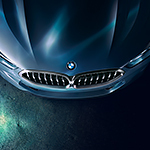 While the overall appearance of the 2019 BMW 8 Series Coupe at BMW of Rochester Hills is that of sports appeal, there are a lot of neat little details that are going to bring forth more emphasis on power and performance as well as presence and visibility. The overall design of the vehicle is low slung overall as well as elongated. This brings forth a sense of exclusivity when it comes to the style of the vehicle. With the elongated design comes the slim window pillars as well as "double-bubble" contouring. Just these together make up the new design of the 2019 BMW 8 Series. The most stand out feature of the BMW 8 Series is the new headlights. These headlights are actually the slimmest of any headlights of any BMW model. All of these designs and features when put together bring forth the type of vehicle that you want to take for a test drive.